Greetings from Afghanistan. I arrived here now almost a week ago and there is so much to share about this experience that it’s hard to know where to start. I’d like to offer a few random observations about Kabul that I’m sure will make more sense upon reflection.I was immediately struck by the contrast between the incredible beauty of the landscape here and what humans have managed to do to this little piece of the Earth. On the flight in to Kabul International Airport, you have stunning views from the plane of the Hindu Kush mountains that surround the city. Once you land, however, you are quickly made aware that something is terribly wrong. Rather than the usual airport scene, buzzing with tourists and commercial flights, you see UN helicopters, military aircraft and surprisingly few people. After entering the dilapidated airport, which is tiny for Kabul’s rapidly growing population, I had to wait only several minutes before seeing my first AK-47. Little did I know how common they are in this city. Seemingly every hotel that caters to foreigners, every government building, many banks and other important building have at least one Afghan in camo with a menacing weapon guarding the entrance. Razor wire is everywhere. In many ways, the city has the feel of a prison. The poor air quality is also immediately apparent. There is so much dust in the air that there is almost a permanent haze over the city. When you are in a car navigating the chaotic roads, it at times looks like you are driving through a cloud or thick fog, but it’s just the dust. This is dangerous for me given that I have cystic fibrosis, but it is deadly for Afghans that have to breathe this air every day. In fact, earlier this month, Afghan authorities announced that 3,000 people die in Kabul every year because of the dust and smog. I wouldn’t be surprised if that was a gross underestimate. One thing I haven’t seen is the American military, which must be keeping a low profile in the city proper. Yesterday, on our way to a meeting with the Afghan Women’s Network, Brian Terrell, one of our delegation members, did say that he saw a US military convoy pass by, but I missed it. While Kabul is apparently fairly safe at the moment – the new US National Intelligence Estimate on Afghanistan refers to the city as an “inkspot” where there is relative security – fighting is raging in many other parts of the country, particularly the south and east. 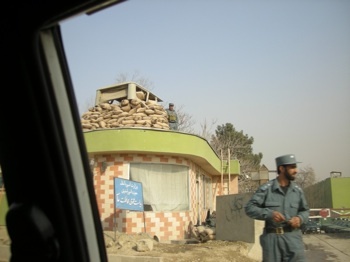 On the day that I arrived in Afghanistan, for example, the AP reported that “a car bomb exploded outside a police headquarters in Kandahar, wounding at least six people and blowing out the windows of buildings up to a mile (a kilometer and a half) away,” and that 500 people in Paktia gathered, “shouting ‘Death to Americans!’ amid local reports that a NATO operation killed seven members of a private security company.” Reading headlines like these from my comfortable apartment in Brooklyn would upset me, but reading them in Kabul is a very different experience. It isn’t just news from some place half a world away, but from right out my window. Now that I’m following the news on the war more closely, I realize that violence like this or worse is a daily occurrence in Afghanistan, even though the mainstream media rarely highlights these tragic stories. I’m sure the lack of attention that these regular bombings and shootings receive is, in part, exactly because they are so common. While President Obama plans to tell the country today that we are on the right track in Afghanistan, the truth is that there is more violence and death here than at any point since the US invasion. The surge in US troops in recent months has led to more soldiers, more Afghan civilians and more humanitarian workers being killed this year than any year to date. How this equates with progress is beyond me.